The Old Stables01263 735640work Self-cateringThe small hamlet of Hyltons Crossways is situated on the outskirts of the village. It is a very peaceful location and is surrounded by rural countryside. Yet it is only a very short drive to the coastal resort of Cromer and the market towns of Aylsham and North Walsham. The National Trust properties, Blicking Hall and Felbrigg, are within easy reach of the property. The whole area is marvellous for cycling and walking with an abundance of quiet roads. The Old Stables has been renovated to retain its original features. All on one level providing comfortable accommodation with character for couples or a family group. Individual, heavily beamed and with an inglenook fireplace, it is situated in a quiet rural position, yet only a short distance from the Norfolk Coast. Shop: 1 mile Pub: 2 miles. Bedroom 1 with a double bed, TV with digital channels and En-Suite Shower Room with shower cubicle, washbasin and w.c.
Bathroom with bath, over-bath mixer shower, washbasin and w.c.
Garden: Fully enclosed lawned garden with patio area, covered sand pit and garden furniture. Also Provided: Books and games. Travel Cot. Pets: Two pets are welcome but do please keep them out of the bedrooms at all times. Extras: Towel hire is available at £4 per person per week, payable on booking. Bikes may be hired from the owner at £20 per person per week. Kindling and wood can be purchased from the owner at £5 per bundle. The small hamlet of Hyltons Crossways is situated on the outskirts of the village. It is a very peaceful location and is surrounded by rural countryside. Yet it is only a very short drive to the coastal resort of Cromer and the market towns of Aylsham and North Walsham. The National Trust properties, Blicking Hall and Felbrigg, are within easy reach of the property. The whole area is marvellous for cycling and walking with an abundance of quiet roads. Notes: Please note that the duvet in Bedroom 1 is a feather duvet. There is extra parking available for trailer parking should you require it, please state on booking. There is parking for two cars and extra parking available for a trailer if required. The local shop is within one mile and the nearest pub is a couple of miles away. The nearest leisure centre and train station are three miles away at North Walsham. 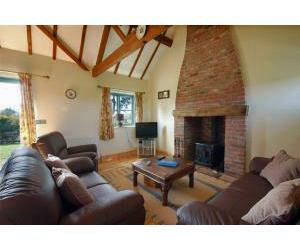 The property is situated less than half a mile from Weavers Way offering fantastic walks, and bike rides, and is also near to the Norfolk Broads, The National Trust properties Blickling Hall and Felbrigg are within easy reach of the property. The whole area is marvellous for cycling and walking with an abundance of quiet roads. Children welcome from any age. Travelling from Aylsham to Cromer on the A140 take the 4th right hand turn signposted Felmingham B1145. Approx. 3 miles along the B1145 between Colby and Felmingham take a right hand turn signposted Hyltons Crossways and The Old Stables will be found on the left.